Pressure changes in the Walk-in Refrigerated Rooms cause the wall panels to move in and out resulting in a breakdown of the seals in the panel junctions, thus permitting ice to form in the wall and cause damage. Manufactuctured from non-corrosive food-safe injection moulded plastic. No mechanical parts to breakdown. A vermin filter is standard. 8 watt & 16 watt Anti Freeze Heater. Multiple Ports are used in larger rooms. Safety Aspect: In a properly constructed freezer room failure to install a pressure relief port/vent could delay the door from opening thereby trapping workers inside. Nordon Pressure Relief Ports / Vents are shipped around the world. 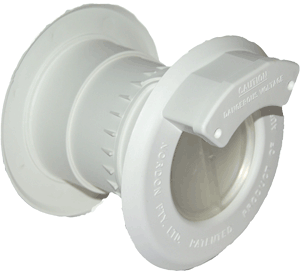 Contact us to discuss other benefits and how to purchase the Nordon Pressure Relief Vent/Port.